Romania's protest-filled year has done little to bring about any long-term change, it's been claimed. The country has seen waves of demonstrations since anti-corruption protests erupted in Bucharest a year ago this week. People hit the streets on January 18, 2017, angered over a late-night government move to decriminalise some corruption offences. The ruling Social Democrats (PSD) appeared to back down in February but experts now say much of what protesters were angry about is still on the legislative table. 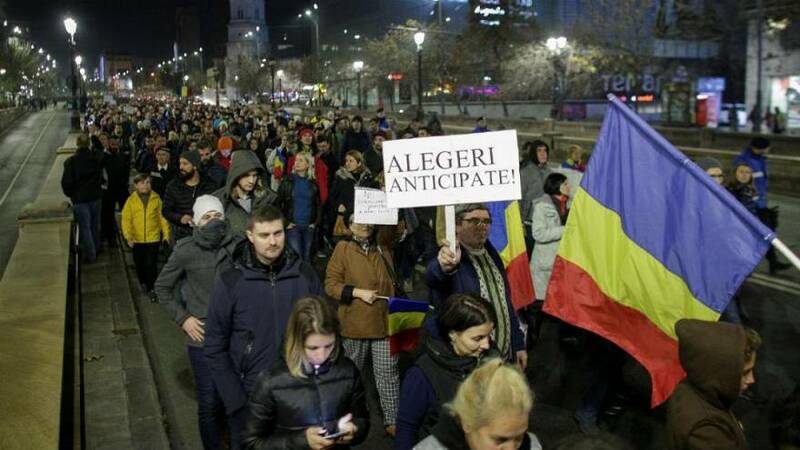 “This is what happens with protest in Romania, they are successful in the short-term but the fact we find reasons to protest so often shows that long-term the game doesn’t change, we are still in the same kind of political paradigm,” said George Jiglau, a lecturer in political science at Babes Bolyai University, Cluj-Napoca. He went onto claim that whatever gets protesters on the streets doesn’t change, it just takes a break. “Of course it’s good to have protest in a democracy, it’s good that they become mobilised,” Jiglau told Euronews. PSD were swept back into power in December 2016 - less than a year after Victor Ponta’s government resigned following anti-corruption protests linked to a deadly nightclub fire in Bucharest. Jiglau claims the fact the corruption-tainted PSD were easily re-elected a year on from the controversial blaze helps to prove his point. PSD also triumphed on a record low turnout, raising questions about whether the Colectiv protesters turned out to vote 12 months later. The result is the leftist PSD has a majority in parliament and while two prime ministers have been ousted in the last seven months this has been a result of internal disputes rather than anything that might affect the party’s grip on power, experts say. “In the wake of social unrest you need a scapegoat and the parties are more than happy to provide them but the way they produce leaders doesn’t change,” said Jiglau. “Despite all the problems in the last year if there were elections next month, PSD might win with the same result. This week Mihai Tudose became the latest prime minister to quit after losing his party’s support. It came after a fresh wave of protests about a draft law that critics say would put the justice system under political control. The European Commission, foreign diplomats and thousands of magistrates joined protesters in criticising the proposals. Yet despite the latest turmoil some see grounds for optimism. Lucian Davidescu, editor of Clean Romania, a good governance portal, said there have been less cases of graft in the country, considered among the EU’s most corrupt by campaigners Transparency International. Davidescu told Euronews a shift in the balance of power within PSD could also herald a shift in policy. “On the one hand the party is as strong as ever and it’s difficult to see how they’d lose. “But on the other hand Liviu Dragnea - leader of the party and one of the most important pieces of the scandal - has lost a lot of power, in one sense. “One year ago it was very likely he was going to be the next presidential candidate. Right now that’s rather unlikely because he became too weak. “This changes the balance of power dramatically and as soon as party members realise that to win elections they may need to change their approach, including what they expect from the laws and justice and the anti-corruption.